Ottawa Junk Car Removal In 3 Easy Steps! Have a car that’s full of rust? Not worth the money to save it? Contact Scrap My Car Ottawa today and have your junk car removed, hassle-free. We’ll handle everything, from the pickup to the payout. Why go through the hassle of trying to sell your junk car? Scrap My Car will take it off your hands, while offering you the highest payout. If you’re looking for Ottawa junk car removal contact us today and schedule a pick-up. Have an old car and not sure what to do with it? Trying to sell it is too much of a headache? Don’t worry, to get rid of your old car in Ottawa, all you have to do is contact Scrap My Car and they’ll do the rest. From the moment you schedule a pickup your work is done. Scrap My Car will pick up your old, remove and scrap, all while paying you right on the spot. Scrap My Car offers the fastest pickup and highest payout in Ottawa. Have a damaged car that isn’t worth the repair costs? Its just sitting in your driveway? Scrap My Car Ottawa can have your car removed in no time, all while paying you for it. If you’re in need of damaged car removal, after and accident or just wear and tear, we will pick up the vehicle and scrap it for you. Don’t just let your damaged car rot in your Ottawa driveway, contact us today and we’ll pick it up, scrap and pay you for it. If you have a car sitting in your driveway, yard or garage that you aren’t using scrapping it is your best option. When you scrap your car in Ottawa with Scrap My Car you are getting the highest payout for you car, regardless of its condition. From the moment you contact Scrap My Car and schedule a time for pickup, your job is done – we handle the rest. We’ll pick up your junk car at the schedule time, remove it and pay you for it. 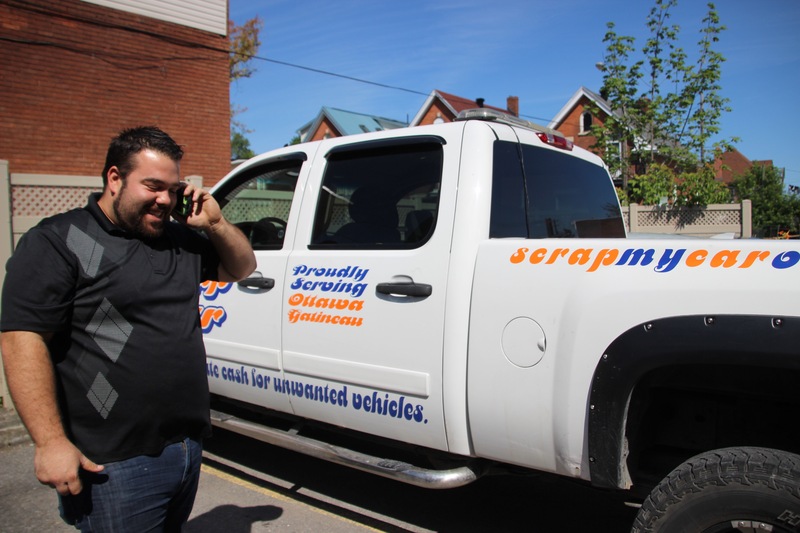 Get rid of your scrap car in Ottawa today with Scrap My Car. Why keep a car that is no benefit to you? Contact Scrap My Car today for your Ottawa junk car removal and make cash for your cars. Don’t just let your car continue to sit and rot, scrap it today. The process is fast, easy and hassle free. Simply contact us via email, text or call, schedule a time for us to pick it up at your earliest convenience and get paid when we pick it up. Contact Scrap My Car Ottawa today and stop worrying about your Ottawa junk car.